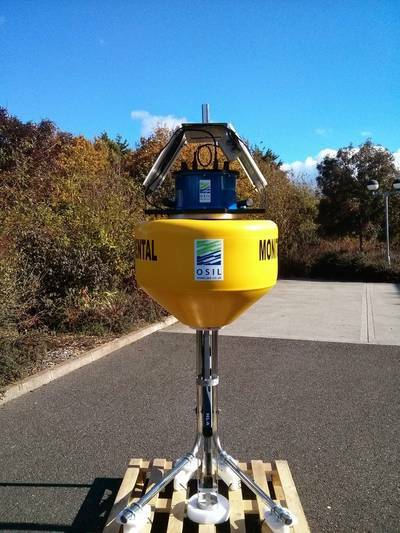 International data buoy manufacturers Ocean Scientific International Ltd (OSIL) are reporting extensive use of its 0.7m Small Field Buoy on international dredging projects. The lightweight, easily repositionable buoys can be repeatedly deployed to follow in the path of dredgers in order to monitor plume activity, and are often complimented by the OSIL 1.2m Tern buoys, which provide more permanent monitoring stations for long term projects. The robust buoys are constructed from rotationally moulded polyethylene hulls that are foam filled for added security. Instrumentation is securely protected from damage and interference by the integral stainless steel deployment frame/cage without interrupting the flow of water around instruments such as water quality sensors or turbidity meters. The durable top frame incorporates two 12W solar panels, a 2Nm navigation beacon, antenna, telemetry and logging equipment (within the waterproof electronics canister), and sturdy grab handles to assist with deployment and recovery of the buoys. • Ocean Scientific International Ltd.